Action Wobbles: Ho Ho Ho, Merry Christmas!!! Happy Holidays Everyone! Oh, I am so glad the big day is almost here. 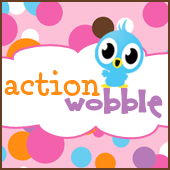 Today I am the featured designer for Action Wobbles. I love Christmas and spending time with my family. We just got home from a cruise last night and I just can't wait to do nothing but hang out at home for a few days. I hope everyone has a super holiday. I put a little wobble under the "Merry Christmas" sign, and I just love the little vintage Santa. Have a fun and safe holiday!!! very cute - wobble wobble - I like to wobble on my cards - Merry Christmas!